If it is 2009 or later, please NOTE! This is an OLD patchwork swap post. As of March 4, the current 2009 Swap is still OPEN. Go to THAT POST to sign up. For those of you wondering if there is still room in the patchwork swap, yes, there is but you MUST send me an email to be considered “on the list.” So, match your comments with an email, please. Sorry, but all the spots are filled!! In other news, I updated my etsy shop today. There’s lots of stuff in there… I should probably stop crocheting now. Hah! Today I really missed living in New York. I was in the middle of making baked mac and cheese and realized there was no milk. It used to be so easy to run across the street if I forgot an ingredient. Sigh. It’s weird to think that the whole city goes on without me, never skipping a beat. I'm sad because I wanted to sign up for the swap but it's already closed! Oh well, maybe next time. But if there is an opening, I'd be THRILLED. If you have someone bail on the swap, let me know. I'd love to participate. Sulu- Yes, that is the key food. I literally lived across the street from it, just up from the Rite Aid. I probably passed you on the street and didn't even know it! 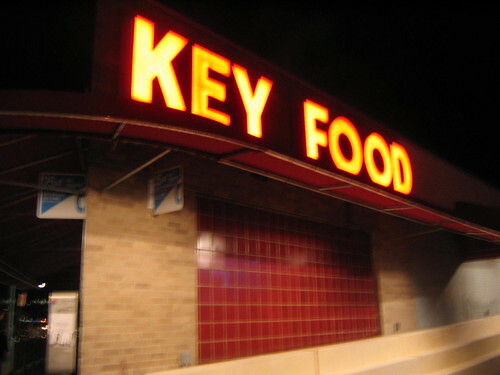 I've been in a missing NYC mood myself recently, and I can't believe it, but your image of Keyfood made me teary eyed. It's the one across from Rite Aid, right? On that street that runs diagonally from 30th Ave. and 33rd Street? That was my grocery store, too. Sniff, sniff.